Last month, ALK Technologies joined forces with the Appian product family. Together we now form Trimble MAPS, a new division within Trimble, specializing in map data and map-centric technology designed for commercial vehicles. The combination integrates ALK’s industry standard mileage, mapping, routing and navigation with Appian’s fleet routing, scheduling and optimization solutions. 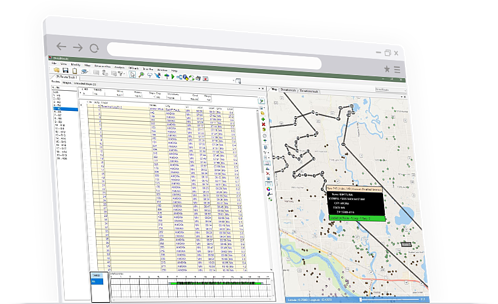 The result is a comprehensive platform designed to serve the entire commercial vehicle routing workflow from network modeling and strategic route planning to trip management and execution to real-time visibility and post-trip analysis. If you're not familiar with Appian and what they do, let's start with a brief history. They are in no way a newcomer to the industry, they've been an industry leading routing and scheduling provider for over 30 years. Originally named “Kositzky and Associates”, it was founded in 1987 as a consulting company focused on implementing vehicle routing systems. There wasn’t a great source for map data in those days so as part of each implementation they had to digitize their own maps. Creating their own tools for in-house digitizing and geocoding was an opportunity to go-to-market with a standalone mapping platform. In 1990 they released GeoWhiz. As the Tiger files came out, Appian were able to switch map sources and began a large undertaking to make the network cohesive and add attribution. In 1995 with sales of GeoWhiz going well and realizing they already had the mapping platform written, a strategic decision was made to move away from the consulting business and focus on creating a routing platform. That product was released in 1997 as GeoRoute. By 1999 the company had established themselves as a legitimate software provider. To formalize this achievement, they re-branded the company “Appian Logistics Software” and changed the name of the routing product to the DirectRoute name which is still in use today. It is named after the Via Appia, one of the earliest and strategically most important Roman roads of the ancient republic. DRTrack was released as their first web based product in 2006. This was followed by a full ground up re-write of DirectRoute in late 2009 to take advantage of modern programming languages and provide 64 bit capability. DRTrack was almost completely re-written again in 2010. In 2011, the company was acquired by Trimble and operated within TMW Systems as “TMW FinalMile”. Did you know? The majority of the top 25 dedicated contract carriers in the U.S. use Appian’s software, including JB Hunt, Ryder System, Swift Transportation and Cardinal Logistics Management. Additionally, over 50 3PLs utilize Appian solutions for bid planning & RFPs, design & what-if analysis and daily operational use in a dedicated account. Appian serves a diverse customer base spanning several industries from food delivery to building material transportation. The Appian product family’s goal is to provide superior customer service and control cost with an end-to-end routing and scheduling, dispatch, visibility and analytics solution. As Brian Larwig says, "Appian has long provided solutions to local and regional fleets looking to optimize their business and customer satisfaction. Becoming a part of Trimble MAPS means Appian can do this at a scale not seen before in the industry. From small planning needs, to fully configurable end-to-end platform solutions, the Appian products offer scalability as operations grow and evolve. Our goal is for each operation to be able to choose which pieces of the end-to end they need, and configure those to their unique requirements. The Final Mile market is rapidly evolving and Appian will be at the forefront of each evolution in whatever way your operation wants to engage; be it applications, APIs, consulting, custom workflows, data analytics, visibility, and more." For more detail, visit the Appian solutions page. Our team will be happy to speak to you and answer any questions about Appian and how it can help your business succeed. Visit our website and fill out the form and we will be in contact soon. Trimble MAPS is dedicated to transforming journeys through innovative routing, scheduling, visualization and navigation solutions.